You want the space to resemble a magazine spread, but just as important is easy workflow when cooking. 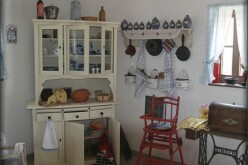 Thus ample storage and clever organization are two important keys to having your dream kitchen. 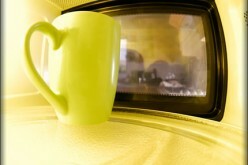 Whether your kitchen is large or small, every inch of real estate is an opportunity for genius organizing. 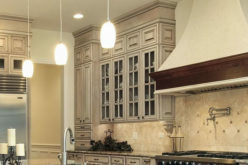 One common example of wasted space in nearly every kitchen is the sliver of space between the refrigerator or stove and the surrounding cabinetry. 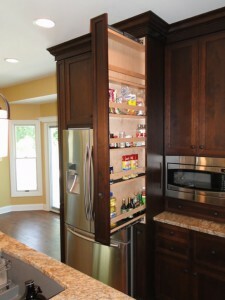 Create a sliding custom cabinet instead to store anything that might fit. 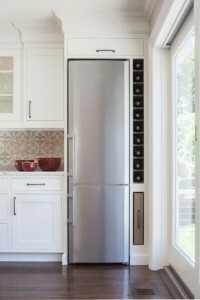 If you’re a wine drinker, having a place to store a few bottles at all times is a must. These two ideas capitalize on existing, unused space. 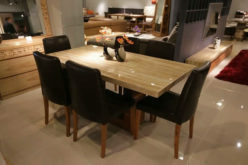 The first example borrows from the sliding storage idea while the latter makes use of an island, keeping your wine bottles out of sight but not out of mind. 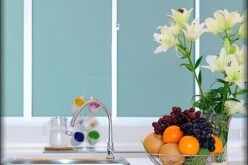 Every kitchen has at least one mock cabinet door or drawer that keeps up the façade of storage when in reality the space is unusable. 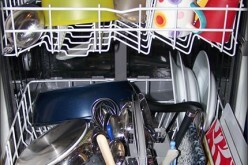 Beneath the kitchen sink and cabinet corners are usually the culprit areas. While you won’t be able to store bulk items beneath the sink, you can install a pull-out drawer to store cleaning supplies. 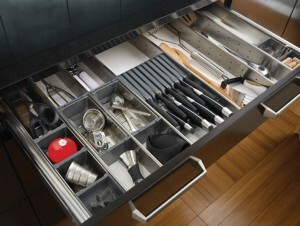 Corner drawers are also perfect for storing long but thin utensils. 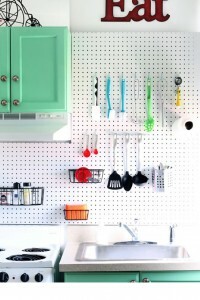 If you’ve ever run into the issue of running out of cabinet space for your pots and pans or are tired of the jumble of cooking utensils in their designated drawer, consider a pegboard wall to help keep things organized. 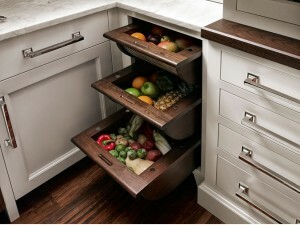 This idea is a bit unorthodox, but if your counter space is limited and your family eats a lot of fruits, consider converting some under-counter space into vented drawers to organize and store them. Note that if fruits last longer than a week in your home or you live in a warmer climate, this idea might not be ideal for you. 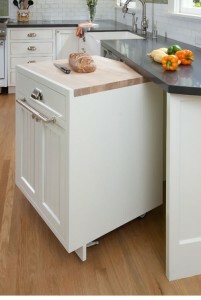 The rolling cart is the perfect organization solution for cramped kitchens. 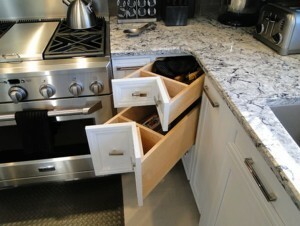 With its flat surface, it offers extra counter space while the storage compartments can be used to store items like your baking goods or small appliances. There’s no need to keep the mixer or waffle maker plugged in and taking up counter space when not in use. Hide it away in the rolling cart instead. It’s amazing how big of a difference a few dividers or wire racks in a drawer or cabinet will make when it comes to reducing clutter. Depending on your budget or drawer size, you can purchase premade dividers or you can get creative and construct your own. For the DIY dividers, all you need are a few pieces of craft board, cut them to the desired size with a hand saw and glue them together using wood glue. 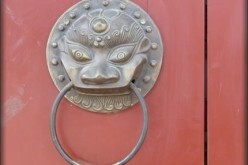 It’s a quick and easy project that costs less than $10. For cabinet organizers, stackable wire racks allow you to take advantage of unused vertical space in your cabinets. 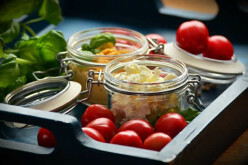 Another creative idea is using an old CD rack to organize food storage lids. 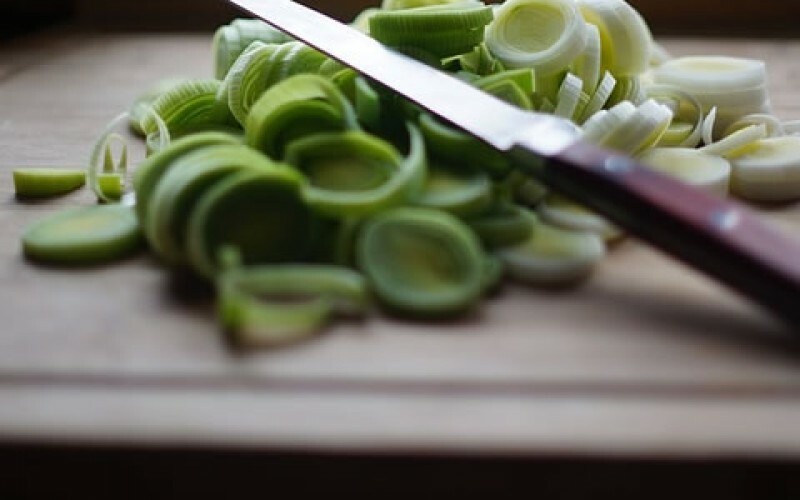 Need ideas and inspiration for your kitchen? 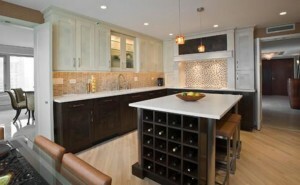 I recommend checking out the kitchen ideas section on Modernize.com.